This works for me, but it may not work for everyone who draws. It may seem “harsh,” but it keeps me from wasting time and helps me focus on what to do differently next time. I work for 20 minutes on a drawing, and then I stop and view my work as objectively as possible. When I see that my drawing is not working after the first 20 minutes, I stop and decide why it isn’t working. Then I start a new drawing. I don’t consider those first 20 minutes as time “lost.” To me, the truly lost time would be continuing on with a drawing that I know I will be unable to rescue. I believe that I learn more from doing three 20 minute drawings than one 60 minute drawing. When my purpose is “fixing,” I am no longer “creating.” The more my focus shifts from expressing visually to repairing a poor start, the farther away I move from what prompted me initially to draw. When I see that my drawing really is working after the first 20 minutes, then I give it an 20 additional minutes. 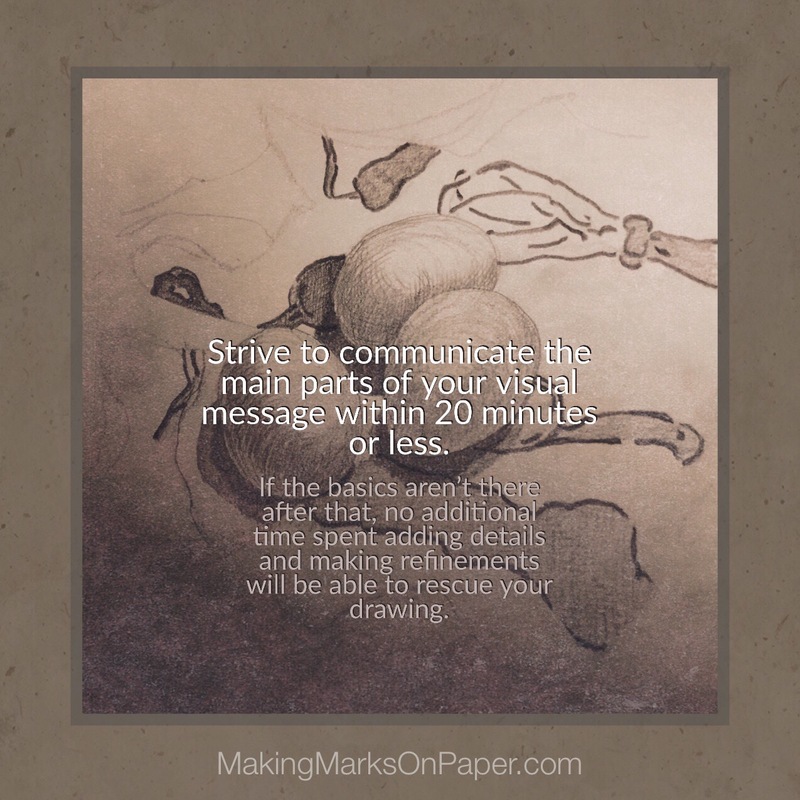 Each drawing is a learning experience and preparation for the next drawing.